The following article appeared in the Courier-Journal Magazine on February 28, 1988. 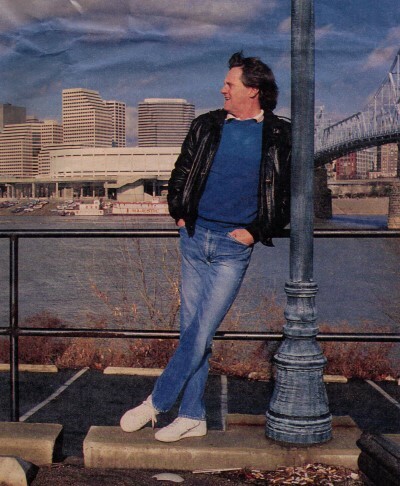 Yes, radio fans, he's alive and incorrigible in Cincinnati, driving deejays in Columbus crazy, and he just may be on the brink of the big time. Remember Rodney Floored and Arnie Barnold? How about Eunice and Bernice, the Siamese sisters connected at the telephone? And the Rev. Deuteronomy Skaggs of the Little Radio Church of the White Winged Gospel Truth, who would beseech his followers: "Don't make me holler/Don't make me shout/Turn them pockets inside out/And shoot the loot to the Lord"? If you remember them, then you remember Gary Burbank. From 1968 to 1980, with three years out to discover he didn't want to work in management, Gary Burbank was Louisville's most talked about deejay. He discovered snow sharks in the powdery drifts during the winter of '79. He discovered Chicken John and Phyllis America in the Kentucky governor's mansion. He has been gone for seven years, but not forgotten, particularly for anyone with a decent AM radio. 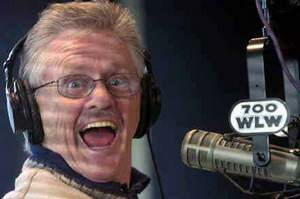 You can pick up his afternoon comedyfest on WLW-AM (700) in Cincinnati. And if you've been listening you know that he is at it again. Burbank is satirizing the politics of resistance with a new character, "Earl Pitts, American." Pitts' daily commentaries are being syndicated nationally by Dorsey and Donnelly Enterprises of Dallas. Twenty stations from Wenatchee, Washington to Jacksonville, Florida, already carry Earl. "For a new product this is very, very quick development," says Pat Clark, assistant vice-president in charge of syndication at Dorsey and Donnelly. "Hiney Wine (a spoof on wine commercials) is considered the most successful syndicated product in radio history. And in the first six months we syndicated it, 26 stations signed up. We have been syndicating Earl Pitts for just three months." At last, it looks as though Gary Burbank may be getting the national recognition that has long been predicted for him. Of course, it has looked that way before. In 1980, when Burbank was still working at Louisville's WHAS-AM, his novelty record "Who Shot J.R.?" 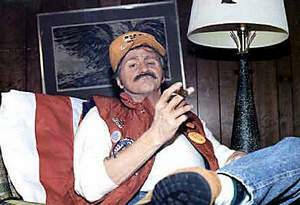 was on the Billboard charts and he was on the John Davidson show. Then it was all dashed in a legal skirmish with the record's producer. Over the years there have been TV pilots, novelty records, song spoofs. But nothing ever clicked big time. "Gary Burbank may be the most talented person not to be a major star in this country," says Bob Moody, former colleague and competitor in Louisville radio. Moody is now operations manager at WPOC Baltimore, and he carries Earl Pitts. In an industry where back-biting is the norm, Gary Burbank gets pats from competitors and colleagues along. "He is one of the greatest talents in our business," says Dan Dorsett, general manager of Lexington's WLAP. "One of the highlights of my young days in broadcasting was I got to go in once and watch him work." Ed Henson, general manager of Louisville's WAVG-AM, says "I'm a big fan of his. We've tried to hire him several times, as has most everybody in this market." "Burbank probably helped more deejays get their starts than anybody anywhere," says Steve Cook, who was recommended to WAKY after Burbank stopped for gasoline in Shelbyville, Kentucky, and heard Cook on the local station. Burbank is universally admired for his wit, wisdom and work ethic. Well, almost universally admired. "The jocks in Columbus [Ohio] hate me," says Burbank. That's because in its recent "best" and "worst" issue, Columbus magazine named Burbank the Best Disc Jockey in Columbus. It really isn't such an outrageous award. WLW's powerful 50,000 watt signal thunders into Columbus, and Burbank attracts 5 percent of the audience, good enough for third place in the afternoon in the Columbus ratings. He owns afternoons in Cincinnati. His show attracts 12 percent of the audience. "Last year at Christmas we sold 8,000 cassettes of his bits," says WLW's Dave Reinhart, program director at WLW and Gary's current boss. In Dayton, he has a 7 percent share and the Number 6 afternoon ranking. In Lexington, Kentucky, he has a 1.6 share, good for 13th place. If the WLW signal were stronger in Louisville, you can bet he'd show up in the ratings here. The reason for his success is simple. "He is so good because he is talented, and because he works hard at it," Henson says. Burbank doesn't go on the air until 2 p.m., but his day usually begins around 7 a.m. He sits in the kitchen alcove of his Northern Kentucky home, sipping coffee and scribbling down last-minute thoughts for comedy bits. Burbank usually arrives at the WLW studio around 10 a.m. His producer, Kevin "Doc" Wolfe, will have everything laid out for him: scripts neatly filed in a folder, commercial tapes stacked in order. Burbank and Wolfe work from the time Gary arrives until 1 p.m. recording the day's comedy bits. "We have to be done by 1 with the creative stuff," Burbank says. "Then we edit 'til 1:30. I go off and read for half an hour: news, anything I can find for live stuff." Much of Burbank's material is tightly scripted, by Burbank, by Wolfe or by two writers Burbank employs on his own. One think Burbank is scrupulous about is crediting his material. "Sometimes when you talk to Gary you think he's obsessed with people stealing his stuff," Moody says. "But there is a lot of truth to what he says." A recent issue of USA Today noted the discovery of snow sharks in Toledo by a local deejay. Louisvillians remember Gary Burbank was doing that bit almost a decade ago. "We've had a number of amazing coincidences with the American Comedy Network," says Burbank. "After we came out with Earl Pitts, they had Spangler Pitts, American. I just say, 'It's an amazing coincidence.'" The end product of Burbank's long hours is a radio show unlike anything else on the air. "On a good day, we'll play four or five records," Burbank says. The rest of the show is filled with news, weather, sports, traffic and comedy, comedy, comedy. Part of it is recorded, part spontaneous. And it isn't just all Burbank and Wolfe. "Listeners are what make this show," says Burbank. "There's one guy who calls himself the Reverend G.I. Lovemoney. He calls from his car phone. My show's an outlet for the regular guys who should be in show business. They know if they come up here with something funny they can get on here." Burbank and Wolfe do basically what they want to on the air. "As long as you have good numbers, you can get away with it," says Burbank. He gets away with more than almost anybody. He mocks politicians and celebrities, sasses commercials, even introduces the sacrosanct news with a cut from "Rocky & Bullwinkle": "Now here's something we hope you'll really like." He can always get away with it because his hard work and talent have made him the Number 1 disc jockey in town. "He grew up on the rough side of the tracks, so he's used to hard work," says John Randolph, owner of WKLO in Danville, Kentucky, and WKX in Eminence, Kentucky. Twenty years ago, when he was Johnny Randolph, he helped bring Burbank to Louisville's WAKY. Gilbert Gnarley (pronounced NAR-lee with as much nasal intonation as possible) may be Burbank's best character ever. "He is a pathetic character," says Burbank. "His main friend is his dog, the Amazing Cresbo. Gilbert was picked on as a kid. And now his whole thing is people don't listen to him." So to get them to listen to him, Gilbert calls them on the phone. He called Sears to point out that his new solar-calculator would be obsolete when the sun burns outs, and suggests a consumer warning label to that effect on the calculator. He called a Las Vegas travel agency to ask about replacing his "lost" travelers checks. After he explained that he lost them playing blackjack, he still convinced the agent he was real. "You know what makes me sick? You know what makes me so angry I could tear the pouch off a marsupial? Those newfangled sporting goods stores…[I went in one] and asked what kind of shell to use on neighborhood dogs, and the fellow says, 'I don't know anything about ammunition, I'm a personal fitness adviser…." They sell these Yuppie-butts rowing machines that you row all day and not go nowhere. And bicycling machines that you can bicycle all day and not get anywhere…. Ever' night the sporting goods store owners of America must get down on their knees and say, 'Thank you, Lord, for making all the rich people so stupid.' I'm Earl Pitts, American." Big Fat is short for "the big fat balding guy with a stubby cigar…and his pants half zipped." He is Burbank's answer to the late-night TV hucksters who interrupt movies to pitch waterbeds. Big Fat breaks into records to sell his latest product, ending each pitch with "This time I'm being honest wit' you." Burbank says, "His best one was selling replacement replacement windows to replace the replacement windows he sold you six months ago, with the guarantee written in Latin." "Sports or Consequences": At 4 p.m. each weekday the Gary Burbank Show goes from duet to full house. The control room fills with people from around the WLW offices. It the gang can't answer a caller's sports question, the caller wins a prize. Usually someone knows the answer, and the crowd unites in a cheer that has become the "Sports or Consequences" Anthem: "We don't, we don't, we don't mess around." Gary Burbank was born William Purser on July 29, 1941 in Memphis, the son of a fireman and a housewife. "My dad was also a songwriter. He had a couple of things recorded. He was a bit of a poet." Billy Purser grew up in the Memphis of the '50s, a red hot music town. "At one time Elvis lived in the same neighborhood," says Purser, er, Burbank. "Johnny Cash was on my paper route. He didn't take the paper though." He learned to play the guitar and sing. And while he was in high school, he started his own band, Billy Purser and the Red Hots. "I wasn't the class clown until I got into radio," Burbank says. "I knew I had it inside me to be funny, but I was afraid to. There were a lot of hoods in my class. I didn't want to make fun of a guy with a tire tool in his back pocket." After completing high school in 1959, he joined the Army. "We went across to Europe on a troop carrier. I kept throwing up everywhere. Somebody mentioned there was an opening for a drummer. I knew how to hold the sticks. I was coordinated enough to keep the beat a little bit. I talked myself into the job so I wouldn't have to do any of the hard jobs, like swabbing the deck." He was discharged in '62, but the only skill the Army had taught him was playing drums. "I went back to school, Memphis State. I finally decided after two semesters I knew everything so I dove in all the way at being a musician." He did session work at Stax records and played with such Memphis music legends as Rufus Thomas, Ace Cannon and Gene Simmons. Then he became the drummer in the Mar-Keys shortly after they had a hit with the instrumental "Last Night." "We were a pretty big name group, but I was still destitute. It was before things got cushy for musicians. I did it at the wrong time. We didn't even have roadies. I remember tearing down my drums after a show and I said, 'Hey, how about some help?' The sax player looked at me and said, 'You picked your instrument.'" Music is a long road, and unless you have a big hit or a big bank account, a hard road. "I made a living But I knew that a sideman of my ability wasn't going to make the kind of money to support a family." And Burbank now had a wife and a son. He remembers the night when he hit upon his life's work. "The band was doing a job with the Heart Fund in Somerville, Tennessee. It was put together by this disc jockey. After it was over we were looking for the guy to give us our money, and the last I saw was his tail lights heading over the hill. And I said, 'That's what I want to be.'" He quit the band and went to radio school while working two jobs to support his family. After graduating, he took a job at KLPL-AM in tiny Lake Providence, Louisiana. "On Sundays I signed the station on and off. I got drunk one night and didn't have time to go home and change, so I went directly to the station. I put on an Andy Williams record and went to sleep. I slept for two hours and the whole time I'm playing the record label, ch-thump, ch-thump, ch-thump. When I finally woke up, I turned on the mike and said, 'That was Andy Williams.'" He wasn't fired, but he knew his days were numbered. "I've never been fired. I've always left right before." He headed west to Monroe, Louisiana, then back east to Jackson, Mississippi, before landing in Memphis and WDIA, the soul station. "I was Johnny Apollo, your blue-eyed soul brother on the front row, putting slide in your glide, dip in your hip, bump in your rump, always playing scoot-your-bootie, roll-your-belly music." He put some slide in his own glide and slid on back to Jackson, then scooted his bootie back up to Memphis to WMPS. "At 'MPS I got off at 9 in the morning but I had to hang around an hour and a half to do production if there was any. It started out I'd sit in the lobby. They said, 'We don't want a disc jockey in the lobby. It looks bad.' So I'd hang around in the hall. They said not to do that either, it looked bad. So I ended up spending that time in the bathroom. I was ready to leave." When the offer came from WAKY in Louisville, he leaped at the chance. He arrived in the fall of 1968, a skinny Southern kid with a huge voice and not much else. "He was using the name Johnny Apollo then," remembers Randolph. "We didn't like that name. Plus there was already a Johnny Randolph and a Johnny Walker in town it would be too many Johnnies." So Randolph sat down to conjure up a new name. "At the time 'Laugh-In' was very popular. Gary Owens was the announcer, and he'd always introduce the show with 'This is Gary Owens live from beautiful downtown Burbank.' I thought Gary sounded a little bit like him, so I just tied the two together. Gary Owens from beautiful downtown Burbank…Gary Burbank from beautiful downtown Louisville." Randolph even had him dressing like Gary Owns. "WAKY had that studio with a window where people could see you," says Burbank. "I had to wear glasses and a suit for a year. A lot of people actually thought I was Gary Owens. I still meet people who think I was on that show." Burbank did his part to further that belief. "Laugh-In" was shown nationally on Mondays, but WAVE didn't carry it until later in the week. "He had his mother sending audio tapes of "Laugh-In" from the Memphis station," Randolph says. "Then he would come on and do the 'Laugh-In' material. Owens would do the same stuff on TV, and it would look like Owens was copying off him. He used every angle." Randolph recognized Burbank's potential and set out to hone his talent. The first thing was to teach him about timing. "Be concise. That's what we preached at WAKY: Don't draw it out, get it down to Reader's Digest size." Burbank sopped up the technical stuff, how to keep a show moving, how to use his diaphragm, but the maturation wasn't complete. He still wasn't "Gary Burbank." And he knew it. "I was just doing stupid deejay humor at the time," he says. "I would listen to Skinny Bobby Harper [another WAKY deejay] and just marvel at the stuff he was doing. It was absolutely brilliant stuff. Finally one day I asked him, 'What do you call that, the stuff you do?' He looked up at me and he smiled, 'Satire.'" It was an epiphany. Satire. No more stupid deejay humor. Gary Burbank, who had always read widely, who had always joked about the foibles of local politicians, altered his humor. It was no longer the old deejay stuff, "Did you hear what the mayor said last night?" Now he began using voices and creating fictitious characters and entire scenes. Burbank has since remarried. He met Carol Anderson, his current wife, during his WAKY years. "Gary was a real rounder before he married Carol," says Randolph. "He was really hurting himself, staying out late, abusing his body." "And he was also probably the world's worst money manager," Moody says. "He was always broke." To illustrate Burbank's nonchalance about money, Randolph tells a story about negotiating Gary's contract. "I said, 'Gary, what do you want? We're proposing to give you a 10 percent raise.' 'Oh, yeah, fine,' he said. 'There are other things we can do for you, material things outside of money,' And he said, 'Well my ex-wife is driving me crazy. Her refrigerator doesn't work. Could you get her a refrigerator? Used is all right." And we said, 'Yeah we can do that.' And he said, 'And storage space for my boat.' We would have given him a lot of things, and here he is asking for a used refrigerator and space for his boat. "And the third thing he wanted was to get his old yellow Cadillac reupholstered. We had a trade-out [an exchange of advertising time for goods or services] so he takes it down to the Seat Cover King, and they take the seat out and there's all these uncashed paychecks." Six. Burbank owns up to financial irresponsibility. "When we got married, Carol had been a secretary for two years. I had been making $30,000 for four or five years. We sat down to put our finances together. She had saved $2,000…and I owed the bank eight bucks." In Louisville, Gary Burbank found his style, satire. With the steadying influence of his new bride, he was ready to focus his energies on his career. 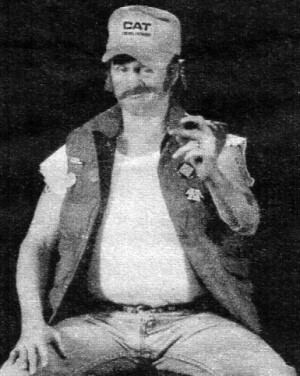 In 1973, Burbank took a job as program director at WNOE in New Orleans. "That was the most fun place I ever worked," remembers Burbank "It was an insane station. We could do what we wanted because no one listened. Before we got there the owners wanted to turn it into a catfish farm." They made fun of radio. Another station in town had a Fortune Phone Call Cash Jackpot. Burbank invented the No Fortune Phone Call Cash Jackpot. He would call people and tell them they would win if they didn't know how much was in the other station's jackpot. "We were doing a parody of radio, and in eight months it went to Number One." "He did well in New Orleans," Randolph says. "But Gary is not good at playing politics, and doesn't like to. And he doesn't like paperwork." So when a deejay offer came from CKLW, a 50,000 watt station Canada, just across the river from Detroit, Burbank jumped at it. No more station politics. No more paperwork. And at last a job in a Top 10 market. "He went to Detroit and hated that," Randolph says. "But he would not be happy today if he hadn't done it. He wanted to work in a Top 10 market, and he wanted to be a program director. He did them both. And that has helped him accept what he is." Gary Burbank was ready to come back home, and for him that meant Louisville. As fortune would have it, WHAS-AM, Louisville's Cuddly Giant, was beginning to pull itself into the 20th century. It was aiming its sights at WAVE, the Number 1 Louisville station at the time. And Burbank was the centerpiece in WHAS' competitive strategy. He was an immediate smash. He had left three years earlier a free spirit. He returned a polished act with a circus of characters: the Reverend Skaggs, Eunice and Bernice, Ranger Bob. What Gary Burbank talked about in the afternoon people were discussing around the water cooler at work the next morning. Maybe it was his workload. He had been doing a daily radio show for almost 20 years. Or maybe it was his age. He was nearing 40. Or maybe it was the broken promises. He had come to WHAS with the assurance that he would get to do a TV pilot. Four years later there was still no pilot. Burbank says it was all of the above and more. The more was his salary, which was more than a disc jockey was supposed to earn. "The first thing Bill Campbell said to me when he became station manager was 'You make too much money.'" On August 28, 1980, Burbank resigned. "I ran dry. It's like being a stand-up comic in the same club for four years. I needed a loafabatical." "If they'd given him the comedy pilot, he would have stayed," Randolph says. "If they'd give him a producer, he would stayed." Instead they groused about his salary. Burbank sat around his Fern Creek home for a few weeks, fielding offers, considering his future. He took a month-long job in Tampa, then came back. In the end, he traveled up Interstate 71 a hundred miles to Cincinnati and WLW. Even so, he elected to stay on the Kentucky side of river, buying a house in Alexandria. Cincinnati is the 28th largest market in the country. It's no small town. But people still ask: Why hasn't Gary ever done the big time, New York or L.A.? It's not that he hasn't had offers. But except for his brief stint in Detroit, the 7th largest market, he has always avoided the big time. "The only time I was in New York my clothes were stolen," Burbank says. "I figured if you lived there your clothes were stolen every day. I never wanted to live in New York or L.A. The people there say, 'It's the Big Apple; if you can make it there, you can make it anywhere.' Why not make it anywhere? Why go through all that grief?" WLW has been home now for seven years. It's the longest Gary Burbank has stayed anywhere. With his Earl Pitts character taking off in syndication, there is talk of T-shirts and ball caps, maybe a record album. He has a TV pilot scripted. "I'm high on this one. It's the first TV thing I've ever been high on." A national production company has seen the script and is interested. But shortly before Thanksgiving another bout with laryngitis sent him to the doctor, where he received some disturbing news. "He found a white spot on my larynx," Burbank says, putting his hand over the vocal cords that have been his paycheck. "He said if it goes unattended, it could develop into cancer." "It is a matter of great concern to him," says Moody. "He's stopped smoking, something he had been trying to do for years, without success." He has transferred his nervous energy to nicotine gum. And he doesn't strain his voice. "I'm staying out of situations where I have to scream for three hours." Another person might be tempted to back off, cut back on the hours, not work so hard. After all he's 46. No longer the Wunderkind. Yet he still puts in the hours he always has. "If Gary wasn't doing that on the radio, he would be doing that around the house," Moody says. "It probably keeps him from getting locked up. If a guy walking down the street was doing that, they'd get a mental inquest warrant. But put him on the radio and he's got a career." "That is what makes Gary happy," says Randolph. "What he wants is love, the love from his listeners, and he is happy." The following article appeared in the Cincinnati Post on December 14, 2007. 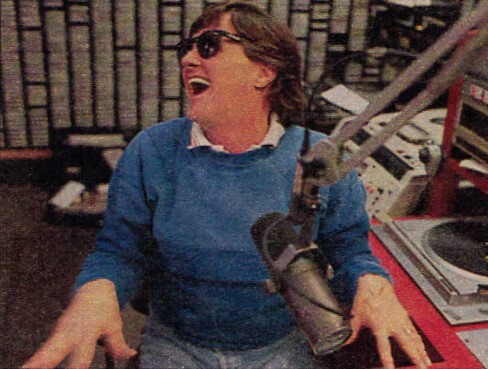 In the spring of 1981, a fast-talking, irreverent DJ from Louisville signed on the air at the then-staid WLW-AM. The region's radio listeners had never heard anything like it. A seemingly whacked-out prankster by the name of Gary Burbank came armed with a studio full of surprisingly rich, goofy characters -Eunice and Bernice, the Right Rev. Deuteronomy Skaggs, the Synonymous Bengal, Gilbert Gnarley and Earl Pitts Uhmerikun. They were all his creations through voice, writing and production editing. It was as if we had known them all our lives. In many ways we did. They were drawn from classic trailer park characters, pious preachers and redneck humor. But in Burbank's voice they became a slightly demented, twisted view of Americana. They were resilient. They could be used to lampoon whatever was happening in the news and pop culture. Gary Burbank brings to a close a 40-year radio career - 26 of those in Cincinnati - when he signs off his 3-6 p.m. shift next Friday. Burbank, who makes his home in Alexandria, is really retiring this time, at age 66 (OK, he will keep cutting Earl Pitts' commentaries). At least twice before, he told his bosses he was hanging up the microphone, but they talked him out of it. This time he says it just feels right. He talks about facing mortality and about not wanting to face the changing corporate radio world brought on by consolidation. And he says, "I have to tell you ... when you hit 60, your brain slows down a bit." Even that is a stunning admission for Burbank, who almost daily astounds listeners and co-workers with his frenetic energy. 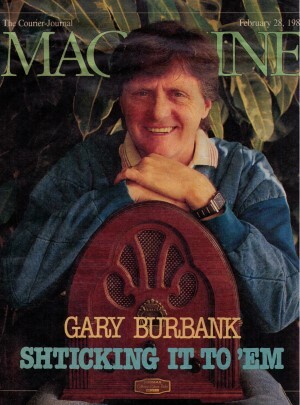 In a Post profile of Burbank in 1982, P.J. 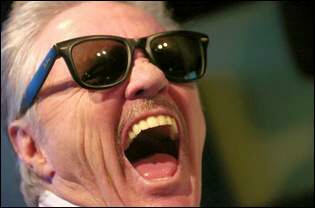 Bednarksi wrote: "He talks like a speed freak...He was born to burn out; it's amazing it hasn't happened." Burbank says it still hasn't happened: "You would think that, but that's been my personality all my life. My mother used to say, 'Had they known what ADD was when you were a kid, you'd be the poster child.' I'm diverted, diverted, diverted." "He is one of those unbridled-ideas people," said Kevin "Doc" Wolfe, Burbank's producer/writer 1981-2000. "It doesn't stop. He's always got an idea. In the space of a minute, he can think of 20 ideas that can make him a millionaire, but he's never going to pursue them." Gary Burbank, long-time WLW-AM afternoon radio host is retiring effective December 21. He says he just can't help mugging for the camera. Burbank's talent to do different voices with amazing nuance, along with his devilish satirical take on pop culture, has let him create a world of rich characters that have had surprising staying power. Earl Pitts seems as sarcastically relevant today as 20 years ago, if not more so. Shock jock humor would become the norm over the years in radio, making Burbank perhaps sound tame. But his satire and wacky characters were considered pretty edgy in the early '80s. At that point, Cincinnati radio humor was in the gentle and often corny realm, such as Jerry Thomas' Granny and the more cerebral dry wit of WLW's James Francis Patrick O'Neill, who Burbank replaced. "Gary Burbank raised the bar for the industry and for radio in this town," said Eddie Fingers, the 22-year morning host at WEBN-FM. "He, and a very few other guys, were out there trying to figure out where the edge was. For better or worse, he helped the rest of us punks find it." Burbank's characters proved the old theater-of-the-mind adage that radio purists still love the medium. Burbank regrets he got involved with producing a TV sitcom pilot of Earl Pitts in the late '80s. "They've always fallen short," Wolfe said about the TV attempts. "The radio stuff has always been strong. There is no Earl Pitts TV show, but he's still on 150 stations. He is an audio character and always will be." characters is Earl Pitts Uhmerikun. "People kid about having the face for radio. I have a brain for radio," Burbank said. "I really do. I have trouble on TV because it never occurs to me to look like what I sound like." Burbank realizes his characters should stay locked up in people's minds. For example, he remembers the businessmen from Dallas who came into his Burbank's Real Bar-B-Q restaurant because they heard Earl Pitts might be in the house. They were fans of his commentaries airing on a Texas station. "I looked at the guys and suddenly realized if I told them I was Earl Pitts, it's like saying there is no Santa Claus. I walked up and said, 'I hate to tell you this, but Earl just left. Let me buy you a beer.' So they started telling me Earl Pitts' stories. They didn't want to see me. They wanted to see Earl Pitts." Burbank just gets a twinkle in his eye when it's pointed out Earl's "news of the right wing" may actually be Burbank's "news from the left wing." "Earl is tongue-in-cheek," he says. "Hey, there are times Earl makes a good point and then you agree with him. But you have to go, 'Wait a minute. How can I agree with this moron?'" Then there is Gilbert Gnarley, the befuddled, drunk or senile (take your pick) prankster who calls businesses with dazed and confused questions. Burbank says there are more than 400 of those bits and he figures Gilbert has left his mark. Gilbert once called the Mrs. Butterworth's syrup company and complained about the "protrusions" on the bottle because he "he was becoming enamored with the syrup as he tried to pour it." A few months later Burbank noticed the design of the bottle had been changed, removing Mrs. Butterworth's bosom. Gilbert called back. "He was cheated out of two protuberances. (As Gilbert), I'm missing two breasts of syrup." Burbank, born Billy Purser, started in radio in his native Memphis after a brief career as a session and touring drummer. He says he got kicked out of Junior Achievement so he started hanging out at radio school. "I just thought it was so cool to stand and watch the guys at radio school." He became a program director at WNOE in New Orleans, then the morning man at legendary top-40 station CKLW in Windsor, Ontario. Burbank acknowledges that was where he made a name for himself. "I just happened to be there when they had a great (ratings) book and suddenly I was the savior of the radio station," he said. In the late '70s, he moved back to Louisville at WHAS to be near the family of his wife, Carol. They have been married 35 years. Like most broadcast veterans, Burbank laments consolidation's effect on radio's creative juices. He notes major corporations look at the bottom line and show little regard for nurturing talent: "I do feel like a dinosaur. I'm the last dinosaur. I'm the last to feel the affects of the meteor. And the meteor is probably called 'corporate radio.'" 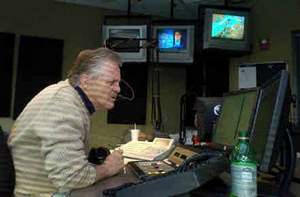 Gary Burbank squints as he reads the computer monitor during a break on his show. Burbank notes corporate programmers have followed a tired formula of putting on shows "with a bunch of angry white me. The comedy is smash mouth. They think 'Friday Night Smackdown' is high comedy." He sees signs the humor pendulum swinging back to his brand of clever social and political satire. pointing to Jon Stewart's "Daily Show" and "South Park." When asked what he will miss most about his show, he hearkens to his first love - music. Burbank grew up in Memphis' rock and soul stew, befriending the likes of Rufus Thomas and doing session work at Stax recording studio. He went through grade school with legendary blues guitarist Steve Cropper. "The thing I will miss most about radio is sitting down one afternoon and having a great band play for you,'' Burbank said. He has been a champion of local music. He remains frustrated the Cincinnati-area music scene is not better supported. "This city is blessed and people do not realize it. They need to wake up and go see some live music. I think it's better than Memphis." Burbank is instrumental in forming a non-profit group to be called Play it Forward, now in organizational meetings, that will help pay medical expenses of working musicians. He hopes to produce a fund-raising CD to kick off the effort early next year. Burbank plans to use his free time writing songs and playing the guitar. He says his drumming days are over because of his asthma. He will continue to split time between his digs on the Rainbow River in Florida and his Northern Kentucky home. He will continue to enjoy his five grandchildren (all girls) who live in the Kentucky area. "Not much will change for me," he said. "Except in the afternoon. instead of doing a radio show, I'll take a motorcycle ride." Four more days for Gary Burbank fans to laugh all the way home with redneck commentator Earl Pitts, "retired eccentric" Gilbert Gnarley and his other crazy characters 3-6 p.m. on WLW-AM (700). Four more days for Burbank, who doesn't sound like he turned 66 in July, to close his show by saying, "I must be off! Bah!" Sure, he's been threatening for 10 years to retire. But "this time he's bein' honest wich you," to paraphrase another of his characters, the Big Fat Balding Guy. "Let's face it, at my age, if I don't stop now, I'm not going to stop," says Burbank, who signs off Friday. He's the longest-tenured personality on the region's top-rated station. He was No. 1 in afternoon ratings in the summer, as he often has been. For 27 years - the last 25 in afternoon drive-time - Burbank has been schticking it to us with satire, comedy sketches, funny phone calls and his daily "Sports or Consequences" trivia show. With help from a half-dozen freelance writers and a trio of sidekicks, he produces "more original humor in a week than all the radio personalities combined in this market," says his boss, Darryl Parks, Clear Channel AM operations director. "I want to see what it's like not to have this kind of pressure to be funny every day," says Burbank. "It's one thing if you're Jay Leno, and just do one-liners, and have a ton of writers," Burbank says. "Jon Stewart does just a half-hour a day. But three hours a day, for 25 years? "Some days I sit down and my brain is empty. That's my official reason for retiring: My brain is empty." Although WLW will not announce Burbank's replacement until next month, it is not expected to continue comedy. "We will make an announcement in January. I don't want to do anything to overshadow what Gary has done at this station and his career. I want Gary to go out on top," Parks says. Reruns will air through Dec. 31, when his contract expires. For Cincinnati radio, Burbank's retirement is the end of an era that dates to the 1960s fictional world of WLW's James Francis Patrick O'Neill. When Burbank arrived in 1981, after success on two Louisville stations, he would record prank calls on reel-to-reel tape, splice it with a razor blade and literally tape bits together. Now his co-workers record and edit comedy pieces on a computer at Clear Channel's Kenwood studios. "Gary makes it sound easy, but it isn't. They put in hours of show prep for each three-hour broadcast," Parks says. Before coming to WLW, Burbank "did it all himself. He didn't have a pack of writers," says Kevin "Doc" Wolfe, a Cincinnati advertising writer and former Burbank sidekick (1981-2000). "He did all the voices. I was amazed at how he could do two characters at once." Burbank has been doing voices since his first radio job, playing records as DJ "Johnny Apollo" on KLPL-AM in Lake Providence, La., in 1964. The Memphis native got into radio after a brief career as a drummer with the Mar-Keys, a Memphis soul band. Earl Pitts: For 21 years, Burbank has been delivering "news of the right wing" at 5:25 p.m. with his beer-drinkin' red-neck "Earl Pitts Uhmerikan." The character was inspired by Burbank's stepfather, Memphis fireman Raymond Woods, from whom Burbank borrowed Pitts' trademark opening line, "You know what makes me sick?" Rev. Deuteronomy Skaggs: One of his oldest characters is the Rev. Deuteronomy Skaggs from the Little Radio Church of the White Winged Gospel Truth. Skaggs is based on radio preachers Burbank met at stations in the 1960s. Skaggs ends each sermon with a plea for money: "Don't make me holler! Don't make me shout! Turn them pockets inside out!" Sports or Consequences: The popular 4-4:30 p.m. call-in trivia show began in the 1980s, when sports director Andy MacWilliams and "SportsTalk" host Bob Trumpy agreed to answer one question after the 4 p.m. news. Burbank dubbed his sports experts the "sufficiandos." Trumpy, who left WLW-AM in 1990 for NBC, started the victory chant still heard today: "We Don't! We Don't! We Don't Mess Around! Hey!" Over the years, his imaginary friends have expanded to include terminally confused Gilbert Gnarley; the vocabulary-challenged Synonymous Bengal (who doesn't want to "besmirch his reparation"); blues singer Howlin' Blind Muddy Slim; the "All My Bengals" soap opera; and the syndicated Pitts commentaries, one of the nation's longest-running radio bits (21 years). Pitts will continue on WLW, probably during Jim Scott's morning show, Parks says. Burbank also plans to produce "All My Bengals" - "Cincinnati's favorite soap opera!" - next fall. "It's a wonder there aren't more traffic accidents on I-71, I-75 or I-275 from drivers laughing their heads off," says fan Mike Wolber, 51, of Amelia. "Gary's originality, voices, characters and predominately G-rated humor is timeless. He is a true Cincinnati radio icon." Rebecca Heckman, Princeton High School science department chair, has been a fan since she was in junior high. "Gary is great to listen to after a long day at work. I can't imagine life without Gary Burbank," says Heckman, 40, of Hamilton. As Burbank began counting down the final days, he's been touched by fans who remember routines or lines from decades ago. "You don't really think about the friends you have that you don't know. People tell me: 'My father was on his deathbed, and one thing that made him brighten up is you.' The fact that you've been a good companion that was needed, that makes you feel a little more worthwhile," he says. 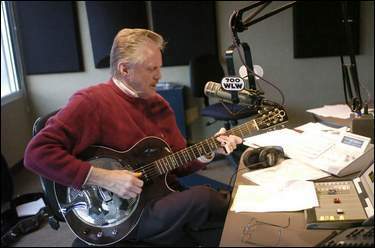 Gary Burbank warms up for a blues tune on his WLW-AM radio show. He'll retire after his last live show Friday, bringing an end to 27 years of local radio satire, characters and trivia in Cincinnati. Many listeners don't know that Burbank has frequently done his part of the show from his Florida home. Ten years ago, Burbank planned to move his entire show to Universal Studios in Orlando, but the deal fell through. For a while in the mid-1990s, the show was nationally syndicated. Now it airs nationwide on XM Satellite Channel 173. He plans to split time between Northern Kentucky and central Florida after retiring. "It still hasn't hit me yet," he says. "I'm sure the day I walk out of here, maybe on my drive home, there will be some heavy thoughts entering my head. Or I'll wake up Jan. 14, and realize I've got nothing to do." His creative focus next year will be helping area musicians. He's organizing Play It Forward, a nonprofit group to raise funds through a benefit CD for musicians with medical or financial needs. XM Radio also has expressed interest in bringing Burbank back next year, but he's not sure how hard he wants to work. "I know what I don't want to do - another daily show. I wouldn't mind doing a show once a week on tape. I want to be able to take off for a whole month if I want to. "I've never retired before, so I just don't know what I'm going to do." At least not for four more days. • Born: July 29, 1941, in Memphis, Tenn.
• Music: Was drummer for his own band in high school, the Red Hots; did studio sessions and toured with the Mar-Keys Memphis soul band in the early 1960s. Also plays guitar and slide guitar, and writes music. • Radio: Started as DJ Johnny Apollo at KLPL-AM in Lake Providence, La., in 1964. Four years later moved to Louisville's WAKY-AM as Gary Burbank. After a stint at powerhouse CKLW-AM in Windsor, Ontario (1974-76), he went to Louisville's WHAS-AM (1976-80). Came to WLW-AM in 1981 as morning host, and moved to afternoons in early 1983. Has syndicated Earl Pitts commentaries for 21 years (now on 160 stations). • Awards: He's the only person to win back-to-back "personality of the year" Marconi Awards from the National Association of Broadcasters (1990-91). • On the record: His novelty record "Who Shot J.R.?," based on TV's "Dallas" cliffhanger, made the Billboard charts in 1980. • Merchandise: Sells Earl Pitts wear, and CDs of Pitts, Gilbert Gnarley and his favorite bits, at http://www.earlpitts.us/, and 800-327-5748. • Book: Greg Hoard, Cincinnati Gentleman magazine editor and author of Joe Nuxhall's "Joe: Rounding Third and Heading For Home," is writing a book about Burbank for release late next year. • TV: He will tape several CET interview shows about his career for broadcast next year. • Restaurant: His passion for hickory-smoked pork shoulder barbecue resulted in the opening of Burbank's Real Bar-B-Q in Sharonville in 1989. • Comic inspirations: Jon Stewart and "The Daily Show," Monty Python, Stephen Colbert, "The Simpsons," "South Park," "My Name Is Earl," Jonathan Winters, Robin Williams, Ernie Kovacs, David Letterman. • Claim to fame: Was picked up by Elvis Presley while hitchhiking as a kid on Peabody Street in Memphis. "He was in an old Chevrolet panel truck. He just drove us around and waved at girls," he says. • Scott Sloan, 9 p.m.-midnight host who's pre-empted most nights during the Reds season. • Tracy Jones, weekend Reds post-game show host, possibly with a co-host. • Eddie Fingers, morning host at sister WEBN-FM who has filled in for Burbank. • Andy Furman, former WLW-AM "SportsTalk" host who lost his "SupertalkFM96.5" show in the WFTK-FM (96.5) format change Friday to "96 Rock." Burbank expects his comedy show to be replaced by talk, for consistency with Bill Cunningham, Mike McConnell and Sloan. "I don't fit in with Cunningham and Sloan. I'm not an angry white guy. I stick out like a sore thumb. But I didn't mind," he says.